The distance from the outside face on a lock/latch forend and the centre of the keyhole or follower. 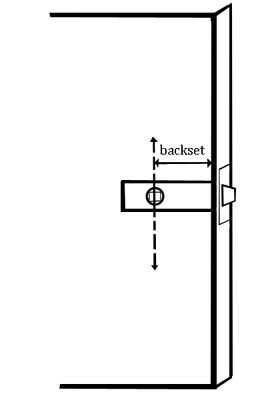 The backset dimension determines how far a handle is from the edge of the door, this can be important in certain situations. The most popular dimension in the UK is 44.5mm and this will determine the centre line of your handle and optional keyhole position on the door. This would be a typical size for lever style handles, however the situation changes if you are considering knob style handles. Door knobs are grasped differently by the user and with a 44.5mm backset there is a risk that the knuckles on your hand could catch against the door frame when turning the knob. So for this style of handle it would be better to have a longer backset, and so it is better to move up to a 57mm backset to allow more room for your hand to operate the door knob. There are other factors to consider however, if your doors have already been cut for a particular size of backset then it will be difficult to change this without causing disruption to the finish on the door face. If you wish to change your door handles from lever style to a knob style then you ideally need door knobs with a sufficiently sized backplate or rose to cover the alteration. There may also be marks left by the edge of the existing handle's backplate too, so some re-decoration may be required to cover these marks. The size of the door's rebate will also be a consideration. This will typically be 12.5mm or 1/2" in the UK but if for some reason your doors have a larger rebate then this will bring the frame nearer to the edge of the handle or door knob and it may be desirable in this situation to have a longer backset to move the handle away from the frame. There are also aesthetic considerations. You may just simply prefer the look of having your door handles further away from the edge of the door and that is fine. The latch workings will be just the same with a longer backset, it will simply move the handle further in from the edge of the door. Some people prefer this when their doors are wider than the typical 30 inch width we see in the UK, having the handles positioned further in from the edge on a wider door can look more balanced in appearance. 44.5mm and 57mm are by far the most popular but further more unusual sizes to those above can be found of certain special locks and latches. Check out our range of Mortice Latches to see our comprehensive range to suit all applications and requirements.